One of our Pre-K classes make these great ornaments. They are pretty easy and they smell SOOOOO good. I have started making them at home, because I just love how they make everything smell so cinnamony. The recipe actually came from one of our books "Month-by-Month, Preschool Almanac," by Annie Stiefel. There are many great projects and recipes in this book. (I got this book from Scholastic. I looked for it to show you a picture, but can't find one, or a purchase price). Mix all the ingredients together until the dough has a clay-like consistency (add one or tow more tablespoons of water if it's too dry). Next, dust a work surface with cinnamon and roll out the dough to 1/4 inch thick. 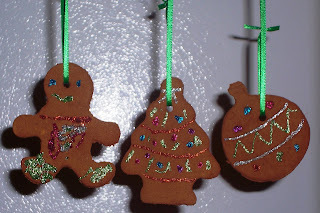 Have the children cut out ornaments using holiday cookie cutters. 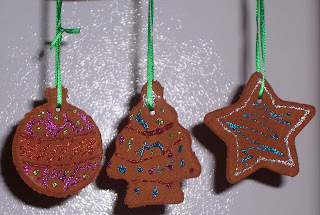 help children poke a hole in each ornament with a straw, then let them dry on baking racks. Drying time will depend on conditions. It may take about a day. After the ornaments have dried, string a ribbon through the hole. We also decorate ours with sequins, glitter glue, etc. They really are a great homemade gift. The recipe yields about four dozen 2 inch ornaments. These are the ornaments the class made. They haven't had a chance to decorate them yet. December 18, 2008: We made our ornaments at home--the house smells great. I just wanted to show you a couple of pictures how they looked when they were finished. these are so cute I think I'm going to try it for our church's sunday school classes!! thanks so much!! !